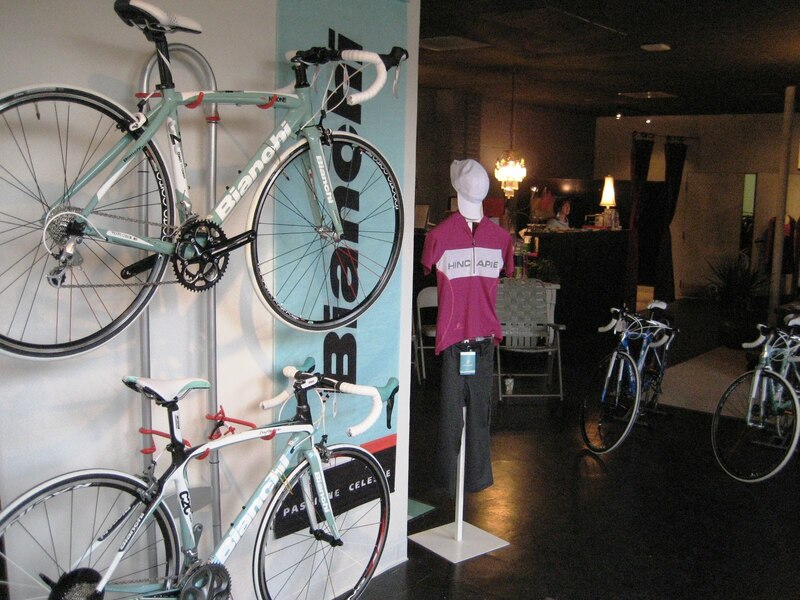 Pedal Chic in Greenville, SC brings Bianchi to the ladies. Greenville, SC has a been a hot bed for cycling for some time now. 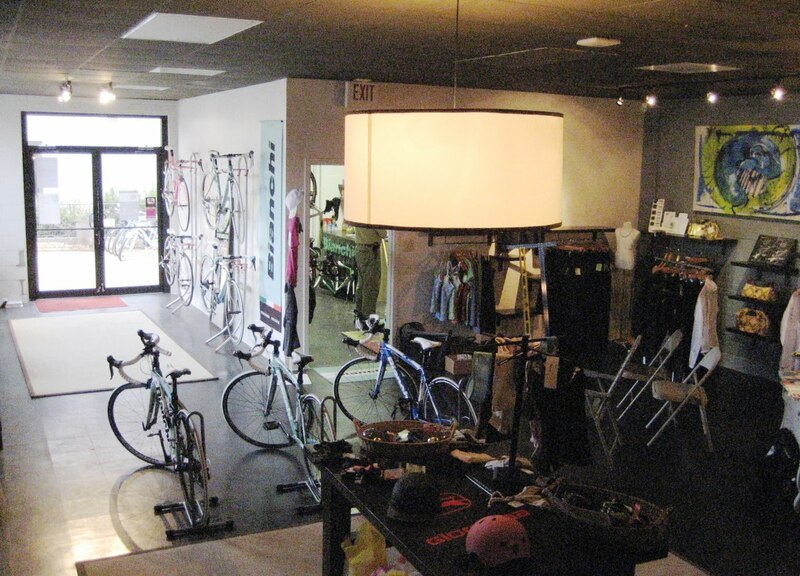 Bike lanes have been implemented on the streets, the US Pro Championship is on the schedule for 2011 and 2012, this area is home to George Hincapie and some epic riding too.Increased participation in cycling creates increased growth for bicycle retailers. However, the female cycling demographic hasn't truly seen increased service to their gender, on a level that they are impressed with, until now. 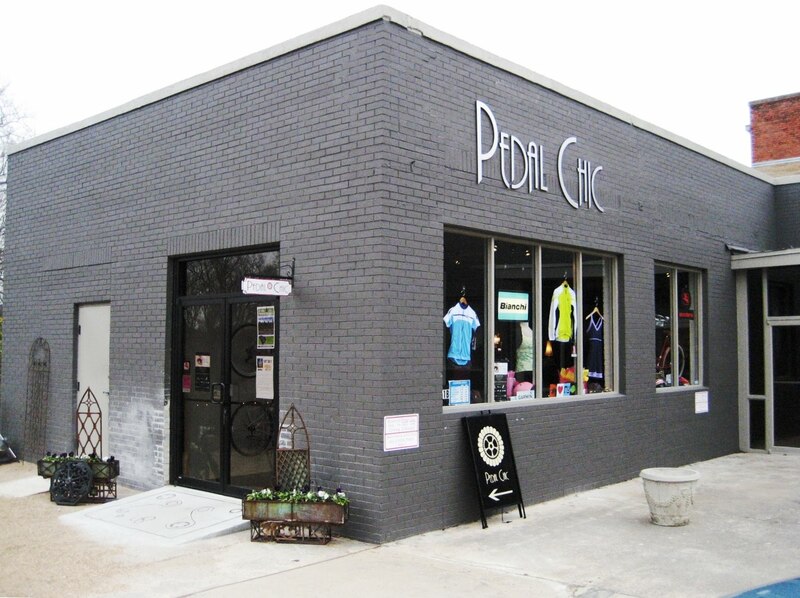 Pedal Chic has been making waves within the local Greenville outdoor sports community for over a year. 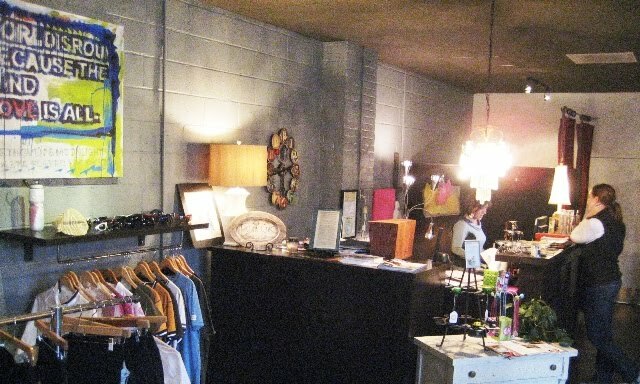 Its boutique business model and new location has them stocking apparel for women of tennis, running, yoga and cycling. 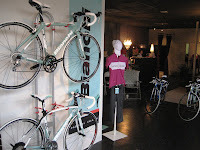 To cap off their active lifestyle is a selection of Dama Bianca bikes by Bianchi Bicycles. Our Dama segment of bikes cover a wide range of flavors. There's fast riding hybrids from the Turismo segment, entry level aluminum road bikes from the Coast To Coast series and quick and light weight carbon road bikes from the Infinito endurance riding platform. 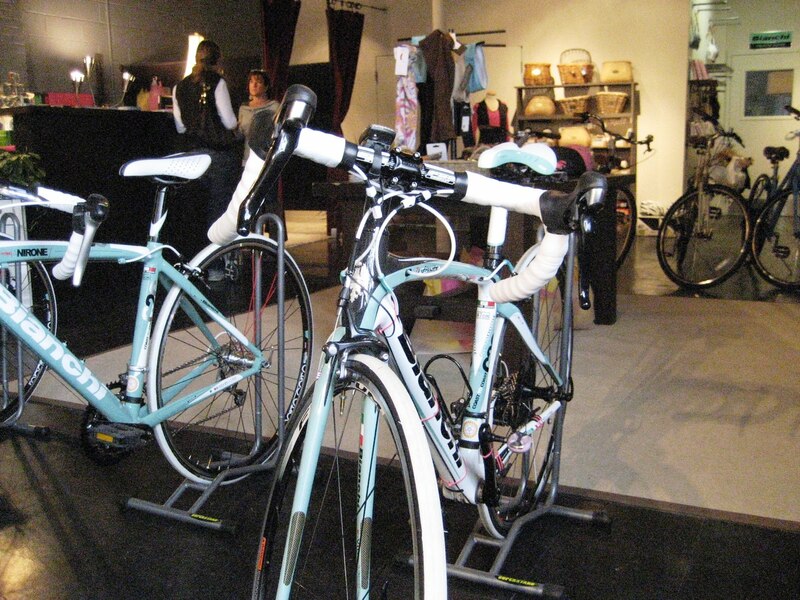 Not every woman needs or wants a female specific/marketed bicycle. In this case, our steel Gran Fondo road bikes are also available down to a 44cm frame size. I think we have all our bases covered here. 2011 Infinito Dama. Robin's bike of choice for her group rides. High modulus, nano-tech carbon frame, K-vid vibration dampening in the fork and seat stays, endurance geometry accented by a slacker head tube angle and longer wheelbase. A very lifestyle based shop. Comfortable and easy to shop. Robin and Pedal Chic proudly display art from the local artists. Behind the shop lies the Swamp Rabbit Trail. 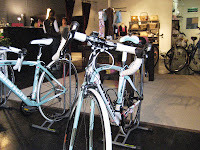 A tow path that is best enjoyed on any of the Turismo line of Bianchi Bicycles. Dama Torinos wait for sunny days. 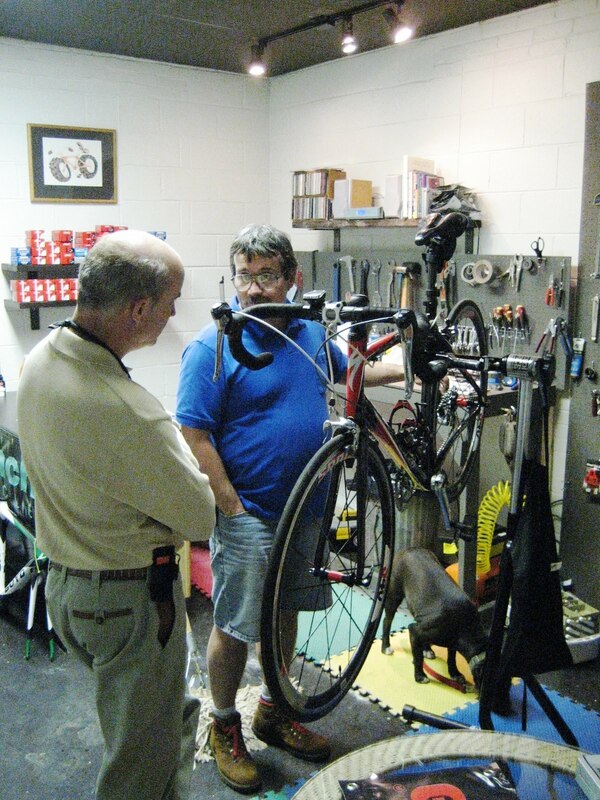 Ron the mechanic (rt) listens to a customer describe an issue the bike was exhibiting. 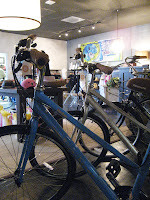 Pedal Chic services all brands of bicycles and sells pavement bikes to men as well. After all, women want their man to ride too! Thanks for the support Pedal Chic!